The most northerly of the Ionian island, Corfu is the closest to both Italy in the west and Albania in the east, and it has been touched over the years by several other foreign cultures. The Greek name for the island is Kerkira, the name Corfu is an Italian version of the ancient Greek word koryphai, meaning "the hills", referring to the two elevated spots in Corfu town where Old and New Fortresses were founded. The Venetians had the most impact on Corfu, culturally and architecturally, as a result of their occupation from 1386 to 1797. The streets of Corfu town, lined with tall houses with wrought-iron balconies and shutters, resemble streets in a typical Italian town and are curiously reminiscent of Venice. The island is divided into a mountainous north and a lower-lying south, with a flat and fertile plain between. Most tourist development is in the north-east of the island, spreading north from Corfu town, and there are many excellent beaches all around the island. 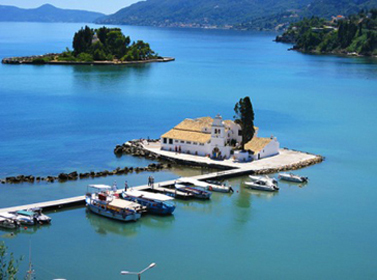 Corfu is big enough to provide escape from the crowds into untouched mountain villages. Our Corfu Island Guide has one purpose, to help the traveler organize his holidays easier and more successfully. In our pages you will find all kinds of services and information. In the Island Tour section you can read about the villages and the beaches of the island and also see pictures, videos, a map and a live webcam of Corfu town. In the Accommodation section you will find many hotels, studios and apartments, you can even book them directly from your computer through our online bookings page at great rates and big discounts. In the Restaurants section we added some nice taverns with description and pictures, we will extend the list by time so check regularly. As you may already know, Corfu is a rather big island and the best way to explore it is by car, so in the Car Rentals section you can rent your car online and have it waiting for you at the port or the airport. We always want to make our website better so if you have any comments, questions or there is something more you would like to see here don't hesitate to contact us.